Do you have a new Android 4.0 Ice Cream Sandwich or 4.1 Jelly Bean [4.2, 4.3 Jelly Bean] based device and there is no tutorial to root it over internet. We have come up with an easy guide to help you will rooting your device in One go. Android phones run on the Linux kernel and companies tend to secure their device with custom coded kernel to make it hard to root or Jailbreak. Some companies also lock up with bootloader and recovery access to prevent user to get access to root easily. But this uniquely designed One click script claims to root any device running the Android ice cream sandwich or Jelly Bean. The developer has put all effort to make it updated with latest devices. Superoneclick can root new devices like Galaxy Note II, Sony Xperia T, Droid Razr HD and Sony Xperia devices. This works on Tablets as well. The Developer says: “I made a small script which is able to root ICS/JB phones. It uses a remount timing issue in Androids “adb restore” service. So normally it should work on nearly all ICS/JB devices, for some it won’t, but the idea may work with a slightly modded version There is a special case for Xperia T and Xperia S,P etc. Phones, this phone run ICS but don’t have android’s native restore with adobe, Sony has added a own custom “Backup&Restore” app, the script handles this case too, just choose the correct option!” Warning: Following this article will root your device which is liable to void its warranty. Further, we will not hold any responsibilities for any circumstances you face. 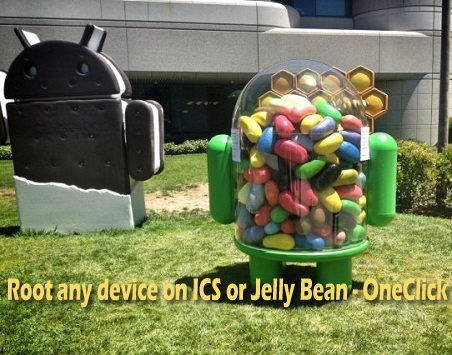 What to do before rooting your device on ICS or Jelly Bean Step 1: This is for users who own an Android device running on Android 4.0 (ICS) or Android 4.1 (Jelly Bean). Step 2: Your device should be charged so that there is at least 70% charge with it, so that you don’t face Power interruptions during the process. Step 3: You should backup all valuable data’s on your phone, so as to reduce data loss during the process. Step 4: Disable all Security programs like Antivirus and Firewall from your computer and uninstall the same from your phone, as these security programs generally tend to interrupt the process. Step 5: Enable USB Debugging in your Android device from the path “Settings > Applications > Development > USB debugging”. The option of USB Debugging should be ticked. Download Bin4ary Root Tool from here to your computer. Extract the downloaded file into a folder onto your desktop. Update: binary4root has been recently updated and works on new Sony Xperia devices like Xperia Z and ZL. There are few more devices on the list, which you can find in the forum thread. The new method is improved to be safer and easier for users. Step 1: Connect your phone to the PC using original USB cable i.e. The cable that came with it. Step 2: Now, from he folder where you’ve extracted the downloaded file, double-click on “RunMe.bat” file to run it. Step 3: Follow all the instructions you see on the application. Note: If you have an Xperia phone, then boot it into “Normal Mode” and if you have Sony Tablets or Similar Device then boot it into Special Mode”. If you follow the methods mentioned in this article, then you will successfully root your device running on Android 4.0 (ICS) or Android 4.1 (Jelly Bean). Let us know if you have any issues, we will try to find a solution for the same. Android will be soon launching Android 4.4 Kit Kat [they have changed the name] and we will definitely come up with a tutorial on how you can root Phones running Android 4.4 easily. 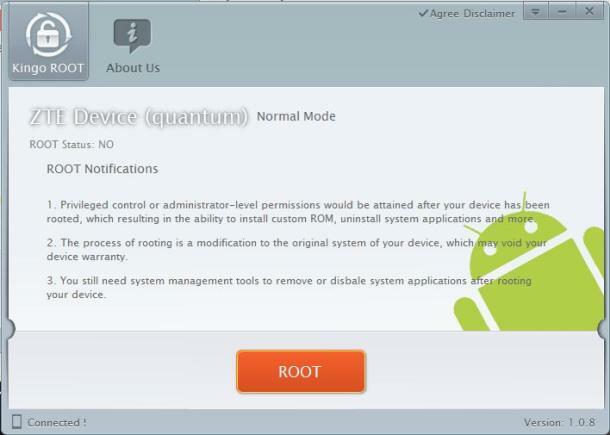 We recently came across another tool “Kingo Android root” which can snap into Android jailbreaking the root user and rights. This tool is compatible with latest Android firmwares like Android 4.1 and Android 4.2. You will need to enable USB debugging and connect your Phone to PC. Run the Kingo root app on your PC and let it detect your Phone. You will need to install appropriate drivers as per your device so that Kingo can recognize and detect the device. Then click the Root button on the app and it will root the Phone or Tablet. Most of the new devices like Xperia Z Ultra, Xperia ZL, Xperia E, Xperia TX, Nexus 4, Galaxy Nexus, HTC Desire HD, One X, Nexus 4, Galaxy Note 3, Huawei, Alcatel, Micromax, Lenovo, Acer and Asus devices can be rooted using Kingo root. You can find the list of devices here. Download Kingo Android root. We would love to help you if you face any issue, so feel free to comment below.